The innovation and inventions through technology and digital revolution around globe has turned daily life much easier. 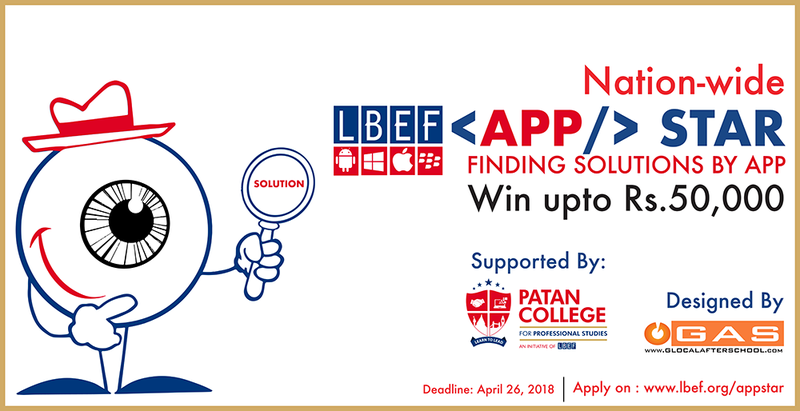 LBEF App Star is supported by Patan College of Professional Studies and designed by Glocal After School. To every problem there is an opportunity to new innovations. This is the platform to coders around Nepal to connect and promote technological innovations to solve the social issues. In the first phase, all online applications will be reviewed. Based on the app idea mentioned in the application form, top 25 teams will be selected by the panel of jury. In the second phase, selected 25 teams will be provided one day training/ seminar on making application by experts. Here, the selected teams will get opportunity to enhance and boot their app idea to submit the prototype. In the third phase, all 25 teams after the seminar will submit their app prototype. Based on the prototype submission, the panel of jury will select top 5 teams. The top 5 teams will be called in Kathmandu. Mentorship sessions will be given to the top 5 teams to enhance their idea. The top five teams will present their idea and prototype in the final day where winners will be declared. The final award function will be conducted in 5-star hotel in Kathmandu followed by Hi-Tea. IT Industrialists, corporate, students, top 25 and medias will be invited in the ceremony. With the concept to develop what the market demands and creating exceptional and well skilled human resource we are here as Glocal After School (GAS), Fuel your skills and knowledge. Fashion is the name where ‘YOU’ matter the most. Why are extracurricular activities (ECAs) important? Why are soft skills needed? How to find a college that fits you? © Glocal Pvt. Ltd. All rights reserved.